Update: Villanova won the 2016 NCAA championship. Josh Hart is living proof that you can be a Scout and a successful athlete. But the Villanova guard, who has his team in the Final Four the 2016 NCAA men’s basketball tournament, wasn’t always sure he’d have time for both. As basketball began to take up more and more of his time, he contemplated giving up on a Scouting career that had started in Cub Scouting. But his dad encouraged him to stick with it. He fulfilled that promise a week before his 18th birthday. 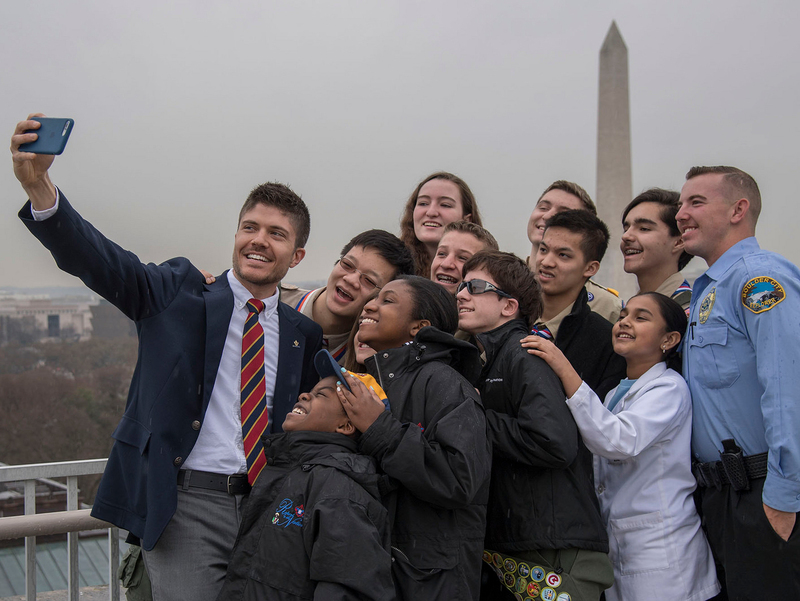 Hart earned Scouting’s highest honor as a member of Rockville, Md.-based Troop 1083 of the National Capital Area Council. Looking back, Hart recognizes it was Scouting that taught him the leadership skills and work ethic needed to succeed in basketball. And succeed he has. He’s been called “the heart and soul of Villanova basketball” and scored 13 points in the team’s win over top-seeded Kansas in the Elite Eight on Saturday. Next up for Hart and Villanova: A Final Four game against Oklahoma (6:09 p.m. Eastern Saturday, TBS). But there’s much more to this story, and Philadelphia Scouter Ed Lynes can tell it. He interviewed Hart to learn how Scouting helped him achieve basketball greatness. Here is his report. Josh Hart’s junior year of college has gone well so far. Last season’s Big East sixth man of the year has grown into a finalist for the Wooden Award, given to college basketball’s top player. How did he evolve from a sixth player to what Fox Sports calls “the heart and soul of Villanova basketball”? It starts with incredible work ethic, Hart says. Josh Hart, Villanova basketball’s heart and soul, is an Eagle Scout. Scouting predates Hart’s days playing basketball; he started in the program as a Cub Scout. His father and older brother were involved in Scouting, and they thought it would be a good opportunity to do something together as a family. Hart would be the first to admit that balancing the dual time commitments of a promising basketball career and the trail to Eagle was a challenge. Like many Scouts who balance commitments between school, church, sports and their troop, Hart got his Eagle done just in time. Experience on the trail to Eagle gave Hart the grit and focus to become the team leader he is today. But how does the equation change when you add thousands of rabid fans during an away game? It’s one thing to lead your troop, but on national TV and in the middle of the tournament? Hart says being “out there” – camping with your troop– is as challenging as the adversity of 10 to 15 thousand screaming fans. High school is a tough time to stick with Scouting. Time commitments ramp up significantly, and many young people are faced with a tradeoff of Scouting or sports. Hart is proof you can do both, and his advice to all Scouts is the same. The 29,000 Scouts in greater Philadelphia all have their eyes on Hart. Those Scouts have their eyes on the NCAA Tournament this month, and they are cheering for the Villanova Wildcats. Hart, however, seeks to keep things in perspective.